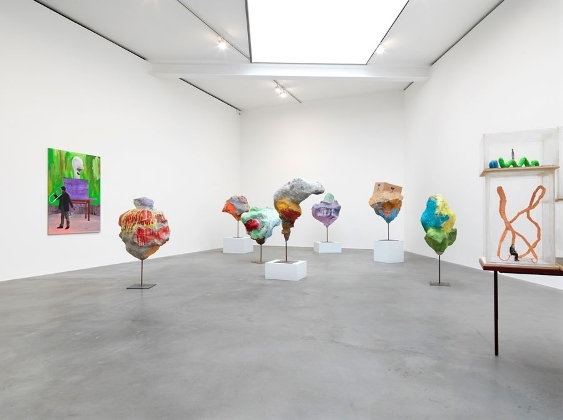 The Gagosian Gallery is currently exhibiting what can only be described as a eulogy of works that embodies the life of the late Franz West, who sadly passed away early this summer in July 2012. A sea of freestanding, ambiguous, figurines adorn the gallery, doused in multicolored luminescent paint. Light-hearted sculptures interact with viewers, inspiring feelings of elation and freedom. Surreal structures almost wrap around onlookers in a fairytale-like setting. 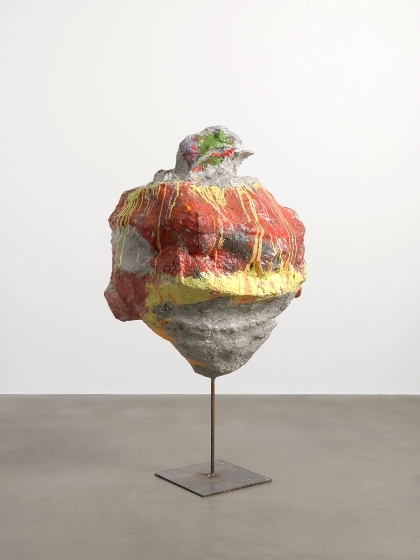 West was born in Vienna in 1947 and his practice has always comprised of a juxtaposition of sculpture and painting that work in tandem in a Pollockesque battle of paint-splattering exuberance, bringing his unworldly creations to life. Throughout his career, West was renowned for his “adaptives”, an exploration of action and resultant reaction. He considered his work to only become art when it was interacting with the spectators. It was the ensuing dialogue of consequential movement that West relished, rather than the pure aesthetic of his works. His inspiration came from his exposure to the action and performance-based art of the 60s and 70s, creating inanimate objects that somehow feel alive. His untitled ‘meteor rock’ creations teeter perilously afloat on spindle-like appendages; even their construction embodies delicacy and fragility. Their core is comprised of papier-mâché, which is further strengthened by Styrofoam and acrylic lacquer before being secured on a steel stem, rooting the foreign configurations firmly on the ground. The flimsy appearance of the supports satirically function as the strongest component of the sculpture. 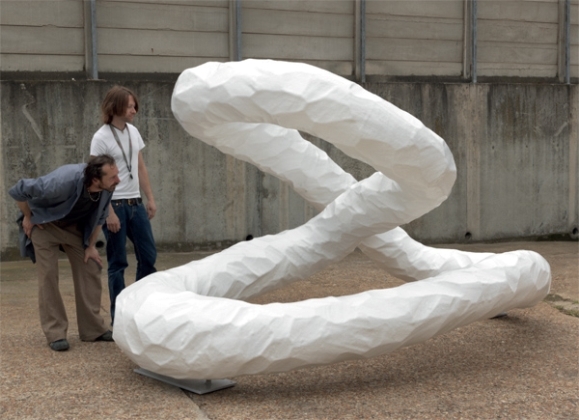 The fragile and ethereal atmosphere continues in West’s furniture-like ‘snake’ monuments. They stand tall, proud and authoritatively in the gallery; however their candy colored bodies prevent them from being too ominous and unapproachable to the viewer. 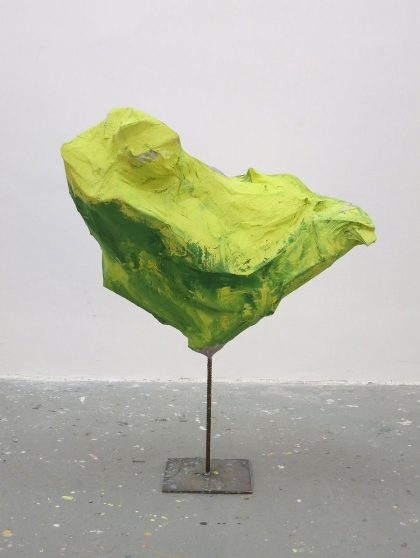 West is all about approachability when concerned with his sculpture: he whole-heartedly implores the viewer to poke, prod and even sit on his works. They condone the inquisitive nature of humans and echo the sensory appeal that a child might have. Blocks of baby pinks and blue catch the light as the sculptures’ fiberglass patchwork constructions reflect the artificial brightness of the gallery, drawing the viewers in. Further reinforcing the purposefully childlike sensibility of the show are the over-painted magazines and adverts that hang on the walls in conjunction with the 3D works. Black and white figurines appear segregated in contrast to the surrounding bold, solid colors. The process of construction resembles a youth’s defacement of public space. The concreteness of the paint suggests the bold lettering of graffiti and the messy brush strokes and dribbles mimic a child at play. One such over-painted image ‘of a man immortalized at play’, provides inspiration for the show’s title, Man with a Ball, reinforcing the concept of childish naïvety and tranquillity that evokes a sense of the infinite simplicity and paradise of youth. West has almost been ‘immortalized’ in his dream world and we, as the viewers, are left to wander through the fragments of his life. 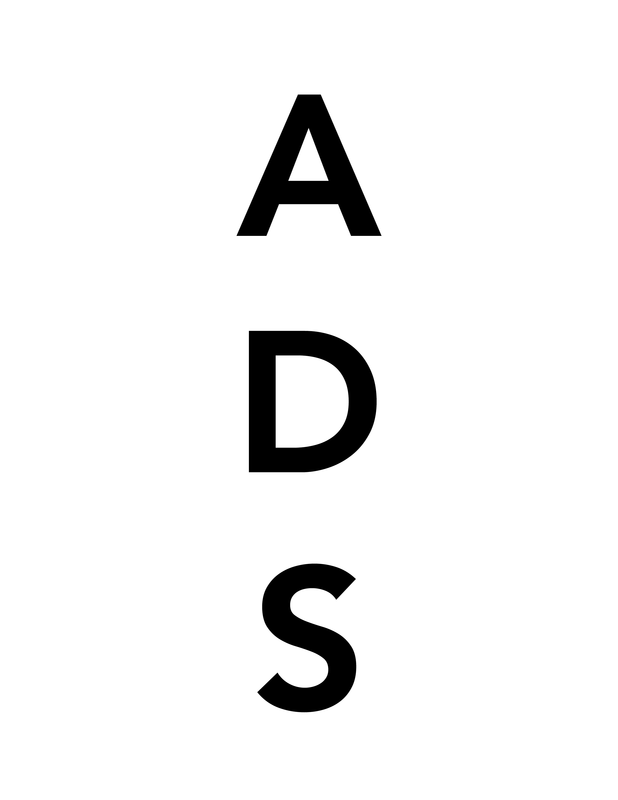 This entry was posted on Wednesday, October 31st, 2012 at 12:01 am	and is filed under Art News, Galleries, Go See. You can follow any responses to this entry through the RSS 2.0 feed. You can leave a response, or trackback from your own site.